One of the many recent packaging solutions that has gained traction this year is from London-based company Skipping Rocks Lab which packages its Ohoo! 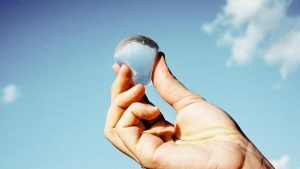 Water in an edible and biodegradable seaweed membrane, which can be eaten or thrown away without harming the environment. The packaging is still in its early stages, but Skipping Rocks Labs is confident that it will be hitting the mass market soon and is dedicated to creating waste-free packaging alternatives. Many food items available today already carry QR codes, which can be scanned using a smartphone and can tell the consumer extra nutritional information about a product, but what else is going on in the smart packaging sector? Packaging Design is as innovative as ever! Consumers are constantly looking for products and packaging that fits into their lifestyles, whether they need something on the go or some handy serving suggestions, consumers appreciate packaging that fits their needs. We now see a wide range of products in re-sealable packaging or individually wrapped to keep things fresh, but with consumers voicing concerns about sustainability manufacturers have turned to technology to make sure that their packaging can be fully recycled. Just in the way that technology has made it easier and more secure to pay for items via smart payment methods such as Apple Pay and Contactless, technology is now playing a role in packaging design as manufacturers look to lead the way in tomorrow’s ‘connected’ household. 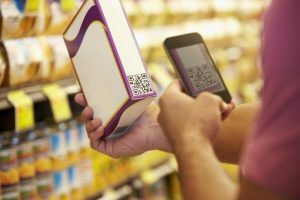 QR codes are a common way to give consumers additional information about food products, but smart packaging has the ability to go further than that, giving consumers up to date information about quantities left, how fresh the produce is and suggesting recipes based on the products in the vicinity. We have already seen some manufacturer’s use smart packaging to enhance food safety by alerting consumers when the contents have spoiled. Tiny sensors are placed on the food that monitor such things as temperature and time, give the consumer up to date information about the product. As technology improves we can expect to see packaging capable of detecting different types of bacteria to warn consumers about any harmful substances and remind them to cook their food thoroughly before consuming. From packaging designs which allow products to be stored more easily, to embedded sensors to inform the buyer, smart packaging is set to become ever smarter in the near future.